Rekindle the spirit of the holidays with the sounds of our classic carolers. 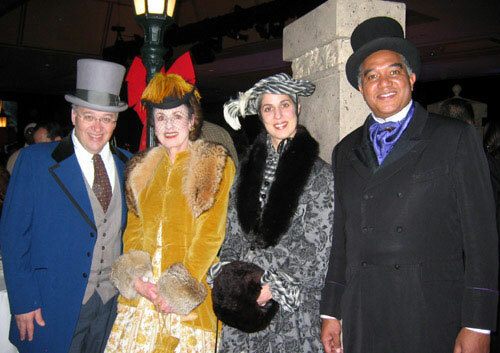 The caroling quartet will transport your guests back in time to 1843 Victorian England and into the pages of the classic novel “A Christmas Carol” by Charle’s Dickens. Our holiday carolers feature four professional vocalists from the S.F. Opera and Symphony Chorus who have been entertaining and enlivening holiday celebrations throughout the Bay Area for over twenty years. The Dicken’s Carolers perform your favorite traditional and contemporary Christmas Carols in lovely Victorian costumes. Male carolers arrive complete with their top hats and British ascots and the female carolers arrive in their best crinolines and plummed bonnets. This entry was posted in Seasonal/Holiday. Bookmark the permalink.